In our sheet music online store you’ll find a huge selection of flexible ensemble sheet music to order online. Explore more than 5.000 sheet music items for flexible ensemble in our shop and order your favorite sheet music now! There is nothing more constant than change - even school musicians know this problem only too well. 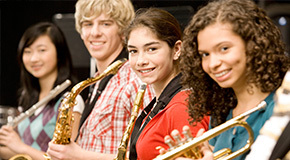 We therefore offer you a large selection of class music arrangements for variable instrumental line-ups from duet to youth wind orchestra, mixed wind or stringed ensembles with a number of sample scores and audio samples.